First, that nobody, no group, is above others. Public servants are obliged to level with everybody, whether or not they'll like what he has to say. And second, that politics was a matter of personal honor. A man's word is his bond. You give your word, you keep it. Joseph Robinette "Joe" Biden, Jr. (born 20 November 1942) was the 47th Vice President of the United States of America, who was jointly elected twice with President Barack Obama. 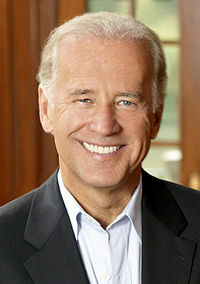 A lawyer and politician from the Delawarean city of Wilmington, Biden is a member of the Democratic Party. I think the Democratic Party could stand a liberal George Wallace—someone who's not afraid to stand up and offend people, someone who wouldn't pander but would say what the American people know in their gut is right. We must rekindle the fire of idealism in our society, for nothing suffocates the promise of America more than unbounded cynicism and indifference. The standard of judgment is no longer results but the flickering image of seriousness, skillfully crafted to squeeze into 30 seconds on the nightly news. In this world, emotion has become suspect - the accepted style is smooth, antiseptic and passionless. It is an exciting and dangerous time, for this generation of Americans has the opportunity so rarely granted to others by fate and history. We literally have the chance to shape the future - to put our own stamp on the face and character of America, to bend history just a little bit. But I respectfully suggest, Major, that the responsibility is slightly above your pay grade, to decide whether to take the nation to war alone, or to take the nation to war part way, or to take the Nation to work half-way. That is a real tough decision. Mr. President, today, in his speech to the National Endowment for Democracy, President Bush gave a vivid and, I believe, compelling description of the threat to America and to freedom from radical Islamic fundamentalism. He made, in my view, a powerful case for what is at stake for every American. Simply put, the radical fundamentalists seek to kill our citizens in great numbers, to disrupt our economy, and to reshape the international order. They would take the world backwards, replacing freedom with fear and hope with hatred. If they were to acquire a nuclear weapon, the threat they would pose to America would be literally existential. The President said it well. The President is right that we cannot and will not retreat. We will defend ourselves and defeat the enemies of freedom and progress. It wasn't enough to have ideas; I had to know my facts. I had to demonstrate command from the minute I started running. I understood that was the test I had to pass. I'm running for president because I think that, with a lot of help, I can stem the tide of this slide and restore America’s leadership in the world and change our priorities. I will argue that my experience and my track record — both on the foreign and domestic side — put me in a position to be able to do that. "Biden officially running for president". MSNBC.com. January 31, 2007. Retrieved on 2007-02-01. You cannot go to a 7-11 or a Dunkin Donuts unless you have a slight Indian accent … I'm not joking. "Biden Say What?". National Journal/C-SPAN. July 6, 2006. Retrieved on 2008-08-22. Response to Brian Williams' question during the South Carolina Democratic primary debates, asking if he could reassure voters that Biden had the "discipline [one] would need on the world stage". "South Carolina Democratic debate transcript". MSNBC. April 26, 2007. Retrieved on 2008-08-23. "Barack Obama Reveals How He Popped the Question to Joe Biden". People Magazine. August 25, 2008. Retrieved on 2008-08-26. Like millions of Americans, they're asking questions as profound as they are ordinary. Questions they never thought they would have to ask: Should mom move in with us now that dad is gone? Fifty, sixty, seventy dollars to fill up the car? Winter's coming. How we gonna pay the heating bills? Another year and no raise? Did you hear the company may be cutting our health care? Now, we owe more on the house than it's worth. How are we going to send the kids to college? How are we gonna be able to retire? That's the America that George Bush has left us, and that's the America that George -- excuse me, if John McCain is elected president of the United States. My memory is not as good as... Chief Justice Roberts. When these barbarians replicated with Steven what they did with Foley, who is from New Hampshire, they somehow think that it's going to lessen US resolve, frighten us, intimidate us. But if they think the American people will be intimidated, they don't know us very well. We came back after 9/11, we dusted ourselves off and we made sure that Osama Bin Ladin would never ever again threaten the American people. We came back Boston strong, blaming no one, but resolve to be certain that this didn't happen again. Today America may be still grieving from Jim Foley, a native from New Hampshire as I said he grew up in Rochester, but the American people are so much stronger, so much more resolved than any enemy can fully understand. As a nation, we are united. And when people harm Americans, we don't retreat, we don't forget, we take care of those grieving. And when that's finished, they should know [that] we follow them to the gates of hell until they are brought to justice, because hell is where they will reside. He wanted me to understand two big things: First, that nobody, no group, is above others. Public servants are obliged to level with everybody, whether or not they'll like what he has to say. And second, that politics was a matter of personal honor. A man's word is his bond. You give your word, you keep it. For as long as I can remember, I've had a sort of romantic notion of what politics should be- and can be. If you do politics the right way, I believe, you can actually make people's lives better. And integrity is the minimum ante to get into the game. Nearly forty years after I first got involved, I remain captivated by the possibilities of politics and public service. In fact, I believe- as I know my grandpop did- that my chosen profession is a noble calling. We all know- or at least we are told continually- that we are a divided people. And we know there's a degree of truth in it. We have too often allowed our differences to prevail among us. We have too often allowed ambitious men to play off those differences for political gain. We have too often retreated behind our differences when no one really tried to lead us beyond them. But all our differences hardly measure up to the values we all hold in common... I am running for the Senate because... I want to make the system work again, and I am convinced that is what all Americans really want. Full disclosure: I do not have absolute faith in the judgment and wisdom of the American people. We're all human, and we can all be misled. When leaders don't level with citizens, we can't expect them to make good judgments. But I do have absolute faith in the heart of the American people. The greatest resource in this country is the grit, the resolve, the courage, the basic decency, and the stubborn pride of its citizens. I wasn't built to look the other way because the law demanded it. The law might be wrong. I had no place to go. It was up or out. I knew I had to be sure-footed about the issues I was talking about. When you're twenty-nine years old, who the hell is going to think you're credible? It wasn't enough to have ideas; I had to know my facts. I had to demonstrate command from the minute I started running. I understood that was the test I had to pass. The first few days I felt trapped in a constant twilight of vertigo, like in the dream where you're suddenly falling... only I was constantly falling. In moments of fitful sleep I was aware of the dim possibility that I would wake up, truly wake up, and this would not have happened. Most of all I was numb, but there were moments when the pain cut through like a shard of broken glass. I began to understand how despair led people to just cash it in; how suicide wasn't just an option but a rational option. I liked to go at night when I thought there was a better chance of finding a fight. I was always looking for a fight. I had not known I was capable of such rage. I knew I had been cheated of a future, but I felt I'd been cheated of a past, too. The underpinnings of my life had been kicked out from under me... and it wasn't just the loss of Neilia and Naomi. All my life I'd been taught about our benevolent God. This is a forgiving God, a just God, a God who knows people make mistakes. This is a God who is tolerant. This is a God who gave us free will to be able to doubt. This was a loving God, a God of comfort. Well, I didn't want to hear anything about a merciful God. No words, no prayer, no sermon gave me ease. I felt God had played a horrible trick on me, and I was angry. I found no comfort in the Church. So I kept walking the dark streets to try to exhaust the rage. There is a great deal of pressure, in the one particular area at least, to prostitute our ideas, if not our integrity. Sleep was like a phantom I was too tired to chase. The system wasn't working, and I thought it was time to err on the side of a new model. What might work, I thought, was a system that promoted personal accountability, consistency, and certainty. Congress could say people who committed the same federal crime, under the same circumstances, were going to jail for the same amount of time. We could give judges a narrower set of sentencing guidelines to work with, and felons would be required to pay the same price. We'd be judging the crime, not the person. I think I instinctively understood that my most important duty was to be a target. People were desperate to vent their anger, and if they could yell at a united States senator, all the better. Part of being a public servant, I came to understand in 1978, was absorbing the anger of people who don't know where to turn. If I couldn't solve the problem for them, I had to at least be an outlet. As I pushed through to the podium, I could hear people murmuring under their breath: "There he is... Goddam Biden.... Kill the sonofabitch." And these were my voters- working-class Democrats. Just because our political heroes were murdered does not mean that the dream does not still live, buried deep in our broken hearts. No matter how well intended our country is, we cannot expect other nations to trust us as much as we trust ourselves. I, too, believe there are natural rights that predate any written political or legal documents; we have these rights merely because we're children of God. To Slobodan Milosevic. Page 266. There is never a time when a president can act to stop a tragedy from occurring without being held politically accountable one way or the other. If he does it and fails, he's wrong. If he does it and succeeds, he was never right because it didn't happen. If we go in and stop an act of genocide, we can't prove what we stopped. I learned later that the surgeon who put Dole back together after he was so badly injured in World War II was an Armenian whose family had deep memories of the genocidal campaign the Turks had waged against them. For the world to follow, we must do more than rattle our sabers and demand allegienace to our vision simply because we believe we are right. We must provide a reason for others to aspire to that vision. And that reason must come with more than the repetition of a bumper-sticker phrase about freedom and democracy. It must come with more than the restatement of failed policy. It must come with the wisdom to admit when we are wrong and resolve to change course and get it right. In spite of the president's phone call, I remained a vocal critic of the Bush administration's foreign policy priorities through that summer because I didn't trust most of the people he had around him. The civilians in the Department of Defense were unlike any I'd ever seen. They seemed to think our nation was so powerful that we could simply impose our will on the rest of the world with almost no ill consequence. It seemed to me that Rumsfeld and his chief deputy at Defense, Paul Wolfowitz, were so totally in thrall to that conservative think-tank-generated ideology that they were steering the president down a dangerous path. And they were so intent on overturning President Clinton's foreign policy initiatives that they were losing sight of the bigger goal, which was keeping America safe at home and engaged in doing good in the world. These were al-Qaeda fighters, the first I'd ever seen up close, and they looked like badasses. As I passed on the outskirts of the grid, many of the prisoners stared directly at me. None of them cowered. I've been in a lot of prisons, but these guys showed a ferocity and a hatred unlike any I'd ever seen. Given Iraq's strategic location, its large oil reserves, and the suffering of the Iraqi people, we cannot afford to replace a despot with chaos. It would be a tragedy if we removed a tyrant in Iraq only to leave chaos in its wake. I made a mistake. I underestimated the influence of Vice President Cheney, Secretary of Defense Rumsfeld, and the rest of the neocons; I vastly underestimated their disingenuousness and incompetence. So George W. Bush went to war again, and just the way the neocons wanted him to- without significant international backing. Things never got better, and Rumsfeld and Cheney never got any wiser. It became increasingly clear that those two men had eroded our country's claim to any moral high ground by flouting the Geneva Conventions. They forced policy decisions that allowed the hideous prisoner abuse at Abu Ghraib in Iraq and encouraged the mistreatment of Muslim prisoners at our facility in Guantánamo in Cuba. I wasn't shy about hammering Rumsfeld. It was that hard; I still feel that way. But I believe that President Bush failed to lead. History will judge him harshly not for the mistakes he made- we all make mistakes- but for the opportunities he squandered. No President of the United States could represent the United States were he not committed to human rights. If you don't understand this, you can't deal with us. President Barack Obama would not be able to stay in power if he did not speak of it. So look at it as a political imperative. It doesn't make us better or worse. It's who we are. You make your decisions. We'll make ours. To Jinping Xi (2011-2012), as quoted in "Born Red: How Xi Jinping, an unremarkable provincial administrator, became China’s most authoritarian leader since Mao." (6 April 2015), by Evan Osnos, The New Yorker. ISIS has nothing to do with Islam. As quoted in "Notable & Quotable" (23 November 2014), The Wall Street Journal. Let me tell you one or two things about Islam. Look, I am Vice President of the United States of America. The president sets the policy. I am absolutely comfortable with the fact that men marrying men, women marrying women, and heterosexual men and women marrying another are entitled to the same exact rights, all the civil rights, all the civil liberties. And quite frankly, I don't see much of a distinction beyond that. I resent when they talk about families like mine that I grew up in. I resent the fact that they think we're talking about envy: it's job envy, it's wealthy envy; that we don't dream. My mother believed and my father believed that if I wanted to be president of the United States, that I could be, I could be vice president! My mother and father believed that if my brother or sister wanted to be a millionaire, they could be a millionaire! My mother and father dreamed as much as any rich guy dreams! They don't get us! They don't get who we are! Ties between our two countries are literally, literally unbreakable. "Israel Resumption of Building Settlements Could Derail Peace Talks". PBS Newshour. 2010-11-08. Retrieved on 2012-07-01. Full disclosure: I do not have absolute faith in the judgment and wisdom of the American people. We're all human, and we can all be misled. When leaders don't level with citizens, we can't expect them to make good judgments. Make sure of two things. Be careful — microphones are always hot, and understand that in Washington, D.C., a gaffe is when you tell the truth. So, be careful. Even the oil companies don't need an incentive of $4 billion to go out and explore. As my grandpop would say, 'They’re doing just fine, thank you'. We got a real clear picture of what they all value. Every Republican's voted for it. Look at what they value and look at their budget and what they're proposing. Romney wants to let the — he said in the first hundred days he’s going to let the big banks once again write their own rules, 'unchain Wall Street'. They're going to put y'all back in chains. Criticizing Mitt Romney, Paul Ryan, and the Republican speech, campaign speech in Danville, Virginia (August 14, 2012). Good morning everyone. This past week we've seen the best and the worst of humanity. The heinous terrorist attacks in Paris and Beirut, in Iraq and Nigeria. They showed us once again the depths of the terrorist's depravity.And at the same time we saw the world come together in solidarity. Parisians opening their doors to anyone trapped in the street, taxi drivers turning off their meters to get people home safety, people lining up to donate blood. These simple human acts are a powerful reminder that we cannot be broken and in the face of terror we stand as one. In the wake of these terrible events, I understand the anxiety that many Americans feel. I really do. I don't dismiss the fear of a terrorist bomb going off. There's nothing President Obama and I take more seriously though, than keeping the American people safe.In the past few weeks though, we've heard an awful lot of people suggest that the best way to keep America safe is to prevent any Syrian refugee from gaining asylum in the United States.So let's set the record straight how it works for a refugee to get asylum. Refugees face the most rigorous screening of anyone who comes to the United States. First they are finger printed, then they undergo a thorough background check, then they are interviewed by the Department of Homeland Security. And after that the FBI, the National Counterterrorism Center, the Department of Defense and the Department of State, they all have to sign off on access.And to address the specific terrorism concerns we are talking about now, we've instituted another layer of checks just for Syrian refugees. There is no possibility of being overwhelmed by a flood of refugees landing on our doorstep tomorrow. Right now, refugees wait 18 to 24 months while the screening process is completed. And unlike in Europe, refugees don't set foot in the United States until they are thoroughly vetted.Let's also remember who the vast majority of these refugees are: women, children, orphans, survivors of torture, people desperately in need medical help.To turn them away and say there is no way you can ever get here would play right into the terrorists' hands. We know what ISIL - we know what they hope to accomplish. They flat-out told us.Earlier this year, the top ISIL leader al-Baghdadi revealed the true goal of their attacks. Here's what he said: "Compel the crusaders to actively destroy the gray zone themselves. Muslims in the West will quickly find themselves between one and two choices. Either apostatize or emigrate to the Islamic State and thereby escape persecution." So it's clear. It's clear what ISIL wants. They want to manufacture a clash between civilizations. They want frightened people to think in terms of "us versus them. "They want us to turn our backs on Muslims victimized by terrorism. But this gang of thugs peddling a warped ideology, they will never prevail. The world is united in our resolve to end their evil. And the only thing ISIL can do is spread terror in hopes that we will in turn, turn on ourselves. We will betray our ideals and take actions, actions motivated by fear that will drive more recruits into the arms of ISIL. That's how they win. We win by prioritizing our security as we've been doing. Refusing to compromise our fundamental American values: freedom, openness, tolerance. That's who we are. That's how we win .May God continue to bless the United States of America and God bless our troops. Weekly presidential address (21 November 2015). In the 21st century, nations cannot; and we cannot allow them to redraw borders by force. These are the ground rules. And if we fail to uphold them, we will rue the day. Russia has violated these ground rules and continues to violate them. Today Russia is occupying sovereign Ukrainian territory. Let me be crystal clear: The United States does not, will not, never will recognize Russia’s attempt to annex the Crimea. (Applause.) It’s that saying -- that simple. There is no justification. Remarks by Vice President Joe Biden to The Ukrainian Rada (9 December 2015). The younger generation now tells me how tough things are. Give me a break. No, no, I have no empathy for it. Give me a break. Because here's the deal guys, we decided we were gonna change the world. And we did. We did. We finished the civil rights movement in the first stage. The women's movement came to be. We have suppressed the black man for 300 years and the white man is now far ahead in the race for everything our society offers. In order to even the score, we must now give the black man a head start, or even hold the white man back, to even the race.’ I don’t buy that. Regarding Iraq... he was a hawk. He repeated false intelligence claims that Saddam Hussein possessed chemical and biological weapons and was seeking nuclear weapons, and therefore was a threat that had to be "eliminated." He later called his vote for the 2003 invasion a “mistake.”...Biden is a self-described Zionist. He has stated that the Democrats' support for Israel "comes from our gut, moves through our heart, and ends up in our head. It's almost genetic. "...There is one issue, however, where he would disagree with the present Israeli government, and that is on Iran. He wrote that "War with Iran is not just a bad option. It would be a disaster," and he supported Obama's entry into the Iran nuclear agreement. Like many other corporate Democrats, Biden champions a misleadingly benign view of the dangerous and destructive role the U.S. has played in the world over the past 20 years, under the Democratic administration in which he served as vice-president as well as under Republican ones. While Biden emphasizes diplomacy, he favors the NATO alliance so that "when we have to fight, we are not fighting alone." He ignores that NATO outlived its original Cold War purpose and has perpetuated and expanded its ambitions on a global scale since the 1990s - and that this has predictably ignited a new Cold War with Russia and China....Like many other corporate Democrats, Biden champions a misleadingly benign view of the dangerous and destructive role the U.S. has played in the world over the past 20 years, under the Democratic administration in which he served as vice-president as well as under Republican ones....Biden might support slight cuts in the Pentagon budget, but he is not likely to challenge the military-industrial complex he has served for so long in any significant way. At the start of the new year, Biden must have been living in the best of all possible worlds. As he engaged in well-publicized ruminations on whether or not to run, he was enjoying a high profile, with commensurate benefits of sizable book sales and hundred-thousand-dollar speaking engagements. Even more importantly, Biden found himself relevant again. “You’re either on the way up,” he likes to say, “or you’re on the way down,” which is why the temptation to reject the lessons of his two hopelessly bungled White House campaigns has been so overwhelming. Regardless of the current election cycle’s endgame, though, it’s safe to assume that his undimmed ego will never permit any reflection on whether voters who have been eagerly voting for change will ever really settle for Uncle Joe, champion of yesterday’s sordid compromises. When the New York Times front-paged its latest anti-left polemic masquerading as a news article, the March 9 piece declared: “Should former Vice President Joseph R. Biden Jr. enter the race, as his top advisers vow he soon will, he would have the best immediate shot at the moderate mantle.".... Joe Biden is poised to come to the rescue of the corporate political establishment... The direct prey of Biden’s five-decade “association with bankers” include millions of current and former college students now struggling under avalanches of debt; they can thank Biden for his prodigious services to the lending industry... Media mythology about “Lunch Bucket Joe” cannot stand up to scrutiny. His bona fides as a pal of working people are about as solid and believable as those of the last Democratic nominee for president. Biden’s fealty to corporate power has been only one aspect of his many-faceted record that progressives will widely find repugnant to the extent they learn about it... One of the many industries that Biden has a long record of letting “off the hook” is the war business. In that mode, Biden did more than any other Democratic senator to greenlight the March 2003 invasion of Iraq...It wasn’t just that Biden voted for the Iraq war on the Senate floor five months before it began. During the lead-up to that vote... he presided over sham hearings—refusing to allow experts who opposed an invasion to get any words in edgewise—while a cavalcade of war hawks testified in the national spotlight... Whether Biden can win the 2020 Democratic presidential nomination will largely depend on how many voters don’t know much about his actual record. It is difficult to over-estimate the critical role Biden played in making the tragedy of the Iraq war possible... More than two months prior to the 2002 war resolution even being introduced, in what was widely interpreted as the first sign that Congress would endorse a U.S. invasion of Iraq, Biden declared on August 4 that the United States was probably going to war. In his powerful position as chair of the Senate Foreign Relations Committee, he orchestrated a propaganda show designed to sell the war to skeptical colleagues and the America public by ensuring that dissenting voices would not get a fair hearing. It is a hard fight. It's extremely difficult, day after day, when you face people and say, 'If Sharia law is taken to its logic this is what things are going to look like' and you come across people who say, 'You got it all wrong'. I had a Q&A in a setting like this one with the vice president of our country. He said ISIS had nothing to do with Islam; I said I beg to differ. He said, 'Let me tell you one or two things about Islam'. I politely left the conversation at that. I wasn't used to arguing with vice presidents. Ayaan Hirsi Ali, speech at the Independent Woman's Forum's Women of Valor Dinner (19 November 2014), as quoted in "Notable & Quotable" (23 November 2014), The Wall Street Journal. This page was last edited on 27 March 2019, at 19:18.